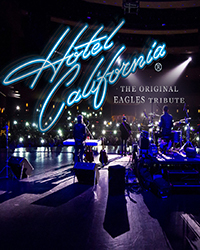 For almost three decades now HOTEL CALIFORNIA have been recreating the legendary sound of THE EAGLES, and thrilling audiences all over the world. What makes HOTEL CALIFORNIA so special? Incredible lead vocal similarity, intensely accurate instrumental work, soaring harmonies, and top flight live performances. With over a century of collective professional experience in the band today, they’re still going stronger than ever.